1. Help women who are facing the many challenges of an unexpected pregnancy by volunteering at or supporting Pregnancy Clinics and Centers . Collect diapers or bring a Baby-Bottle Fundraiser to your church or school, raising money for a local life-affirming pregnancy support center. Open your own home to a pregnant woman or support the many maternity homes in our state. Encourage your church to start a Gabriel Project or an Embrace Grace program wherein your whole church/community comes alongside women who are facing the many challenges of an unsupported pregnancy. Open your home and heart to love a child through foster care or adoption at organizations such as Bethany Christian Services. Donate baby clothes to organizations such as LovedTwice to help moms and babies! 2. Promote post-abortion healing opportunities in your church and community. Make sure your church, family and friends know about post-abortion healing for anyone who has been hurt by abortion. See the Abortion Recovery International website and the Rachel’s Vineyard Post-Abortion Healing Retreats in California . A simple “Pregnant? Need Help?” message in your church bulletin with the phone number to your nearest Pregnancy Resource Center, along with a “Hurt by Abortion?” prompt, followed by information about the nearest post-abortion healing ministry can help save lives and heal hearts! 3. If you are a person of faith, pray for an end to abortion, and invite your friends, family, and church to join you! The Fall 2016 40 Days for Life campaign will begin Wednesday, September 28th in over cities throughout California and around the world, all praying to end abortion. Get Pro-Life Prayers of the Faithful in churches throughout our state, praying and fasting for an end to abortion. Just think if every church in California was praying to end abortion! 4. 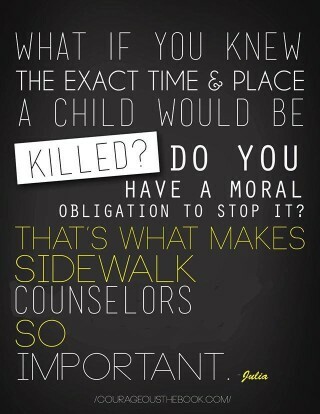 Help educate people about abortion. Distribute pro-life literature at your school, workplace, churches, and other public places in your community. Human Life Alliance has some of the best materials and sometimes they will offer them at discounted prices or for FREE. Bring a Justice for All training to your community, school, or church! Order Life-affirming Precious Feet Pins, pro-life clothing, fetal models, bumpers stickers, and just about anything else you can think of from Heritage House . Promote Pro-life information through Social Media. See Online for Life and The Radiance Foundation for outstanding examples, and find daily Pro-Life news at LifeSiteNews, Jill Stanek, LifeNews.com and LiveActionNews. 5. Vote Pro-Life. Make LIFE a priority issue! Find out who your state legislators are and where the candidates stand on ending the life of babies in the womb. Their position on abortion is important even for candidates running for local school board, city council, and county supervisor elections, as these politicians often go on to run for state office. 6.. Organize your own pro-life event. Bring in a speaker. Hold a public debate. Have a musical benefit concert. Have a candle-light vigil, post-abortion memorial ceremony and music at the abortion clinic sidewalk one evening. The possibilities are endless! See Students for Life for ideas and resources! 7. Join or start a Students for Life club at your school or a Respect Life Ministry at your church. Just think if every high-school and college in California had a Students for Life organization and every church had a Respect Life Ministry, impacting hearts, changing minds, saving lives, and restoring hope throughout our state! 8. Learn how to help women choose LIFE, rather than abortion, by providing information, support, and assistance through Sidewalk Counseling.